Following the launch of the new 12-inch Retina MacBook earlier this week, Apple Stores in the U.S., Australia, Canada, France, Germany, Italy, The Netherlands, Spain, U.K. and other countries have begun receiving limited stock of the notebook to set up as display models and to fulfill in-store purchases. 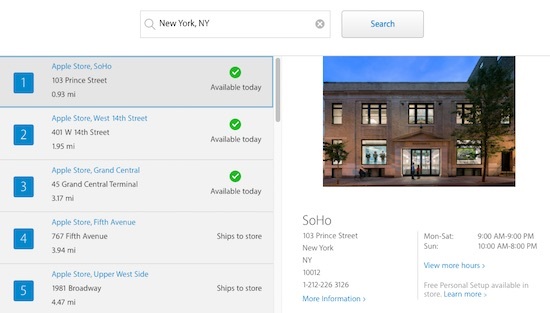 Apple today reenabled its web-based Personal Pickup tool for the 12-inch MacBook, and the availability checker shows that select models are currently in stock at select Apple Stores in or near major U.S. cities, including Boston, Chicago, Dallas-Fort Worth, Houston, Los Angeles, Miami, New York, Philadelphia, Phoenix, San Antonio, San Diego, San Francisco, and Washington D.C.
Outside of the U.S., the 12-inch MacBook is also available in or within the surrounding metropolitan area of a number of major international cities, including Adelaide, Amsterdam, Barcelona, Berlin, Brisbane, Hamburg, Ottawa, London, Madrid, Milan, Montréal, Munich, Naples, Paris, Perth, Rome, Sydney, Toronto, and Vancouver. Many other locations offer the notebook on a ship-to-store basis. Due to limited per-store availability of the 12-inch MacBook during launch week, it is highly recommended that prospective buyers call their local store ahead of time to confirm in-store stock. A crowdsourced list of Apple Stores with new 12-inch MacBook stock is also available in the MacRumors discussion forums. The new 12-inch MacBook is also coming to Apple Authorized Resellers like Adorama, Amazon, Best Buy, B&H Photo, MacMall, and others. 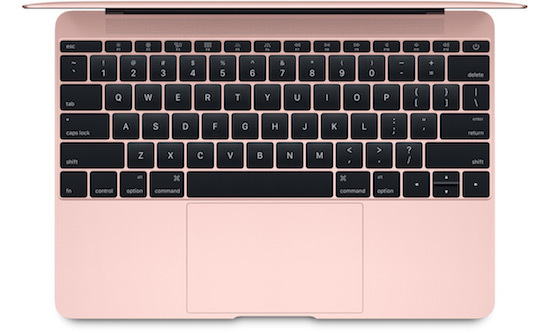 an overpriced fashionable netbook in pink. Thats what I always wanted. I went to the Apple Store yesterday because my iPhone 6 plus had the horrible glitch of not registering any touch on the screen unless I turned the phone on/off. Well, I asked the employee there what his thoughts were on the MacBook. "Waste of money - just get the spec'd out MacBook Air 13" for less than $1200." EDIT: By spec'd out, he meant everything except the storage, which can be upgraded separately whenever you want to 1TB. So in other words he misled you. The fully spec'd MBA is $1349, before upgrading the storage. And it doesn't come with force touch or a retina display. It also weighs an extra pound. Perhaps he doesn't see a need for the rMB for himself. And frankly, I would likely buy the MBA given the choice. But for him to give you a fair and intelligent response to the question he would have needed to start by asking you whether retina, force touch and weight were important to you. Not sure why anyone would buy this over the air, guess for the screen but this is only for light casual usage.. This thing even stutters watching streaming video on youtube.. I've been wanting to buy a 12" MacBook since October and been waiting patiently for the update before pulling the trigger. I ordered mine as soon as it was released and can't wait to get my hands on it. Why buy it over an Air? - I very rarely do any processor intensive stuff, but opted for the 1.3 GHz to be safe. - It's a stunning looking machine in my opinion. All in all it's exactly what I require from a laptop at the moment, the thing about the ports is absolutely not an issue for me, I also like the keyboard etc basically the only downside is the price... But I've wanted a MacBook since 2012 and my current laptop is a 2008 HP noisey, overheating piece of crap so I figured I'd treat myself! Hope it'll be worth the wait and cost cause I've been waiting a long time! It looks like the silver Macbook got a sunburn. Must wait for WWDC hopeful pro update....must wait....so tired of waiting Apple! Person 1: I bought a MacBook because it does everything I want it to do and and I love the look and size. Person 2: But can it do 150 layers in Photoshop while simultaneously ripping a BluRay of The Martian while attached to two 4K/60Hz monitors? If not, epic fail, noob. No it doesn't, and I have the 1st gen. This thing even stutters watching streaming video on youtube..
False. Video playback is absolutely great. I can certainly make my 2015 MacBook stutter by playing a full screen FPS at high-resolution settings, but that's really not what it's made for. If I had the money I would actually buy it, it would be the perfect machine for me.